Philadelphia, PA – June 5, 2017 – Janney Montgomery Scott LLC (“Janney”), a leading full-service wealth management, financial services and investment banking firm headquartered in Philadelphia, PA, announced that Dan Wantrobski, CMT, has rejoined the firm as Director of Research. Mr. Wantrobski has over 23 years of experience as a technical analyst and strategist. He spent the first 10 years of his career at Paine Webber and UBS where he developed his expertise as a technician and strategist following both the equity and fixed income markets. He also spent time at Fox Pitt Kelton, Bedford Quantitative, New Albion Partners, and Janney as the firm’s Technical Strategist. 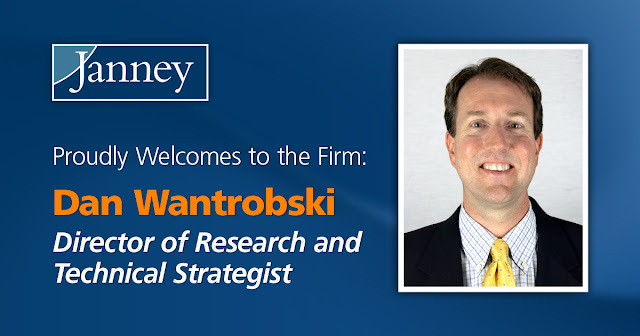 “We’re thrilled to welcome Dan back to Janney in an expanded capacity, where in addition to taking over leadership of the firm’s research department as Director of Research, he will also resume his publishing role as Technical Strategist.” said Andrew M. Maddaloni, Head of Equities. Mr. Wantrobski replaces Mr. Maddaloni as Director of Research. Mr. Maddaloni was promoted to Head of Equities in April 2017.